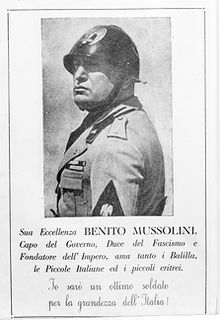 Benito Amilcare Andrea Mussolini (29 July 1883 – 28 April 1945) was an Italian politician, one of the key figures in the creation of Fascism. Leading the National Fascist Party he was the prime minister of Italy under Victor Emmanuel III of Italy, from 1922 until 1943, when he was overthrown; rescued by German commandos, he then became the leader of the Italian Social Republic from 1943 to until his summary execution by members of the Italian resistance in 1945. Everybody has the right to create for himself his own ideology and to attempt to enforce it with all the energy of which he is capable. For my part I prefer fifty thousand rifles to five million votes. Variant translation: The national flag is a rag that should be placed in a dunghill. The rapacious property-owning American bourgeoisie admits no limits, possesses no scruples and does not share the fears and the cowardice of our bourgeoisie. [They are] violent, absolute criminal. When they feel the need, they simply stain their hands with proletarian blood. They lack any human sense. They are only interested in exploitation. With the unleashing of a mighty clash of peoples, the bourgeoisie is playing its last card and calls forth on the world scene that which Karl Marx called the sixth great power: the socialist revolution. It is blood which moves the wheels of history. Militarism! Here is the monstrous leech that is incessantly sucking the blood of the people and its best energy! Here is the target for our attacks! We must put an end to barbarism, proclaim that the army is now a highly organized school of crime and that it exists solely to protect bourgeois capital and profits. We must not be deterred from proclaiming ourselves international socialists. We recognize no borders and no flags, we hate all steel, every institution that exist to kill men, waste energy, strangle the advance of the workers. To-morrow, Fascists and communists, both persecuted by the police, may arrive at an agreement, sinking their differences until the time comes to share the spoils. I realise that though there are no political affinities between us, there are plenty of intellectual affinities. Like them, we believe in the necessity for a centralised and unitary state, imposing an iron discipline on everyone, but with the difference that they reach this conclusion through the idea of class, we through the idea of the nation. Fascism establishes the real equality of individuals before the nation… the object of the regime in the economic field is to ensure higher social justice for the whole of the Italian people… What does social justice mean? It means work guaranteed, fair wages, decent homes, it means the possibility of continuous evolution and improvement. Nor is this enough. It means that the workers must enter more and more intimately into the productive process and share its necessary discipline… As the past century was the century of capitalist power, the twentieth century is the century of power and glory of labour. As quoted in Revolutionary Fascism, Erik Norling, Lisbon, Finis Mundi Press (2011) pp.119-120. Speech given by Mussolini to a group of Milanese Fascist veterans on October 14, 1944. A revolutionist is born, not made. Stanislao G. Pugliese, Fascism, Anti-fascism, and the Resistance in Italy: 1919 to the Present, Oxford, England, UK, Rowman & Littlefield Publishers, Inc., (2004) p. 43. Mussolini’s speech in Milan, March 23, 1919. In the whole negative part, we are alike. We and the Russians are against liberals, against democrats, against parliament. As quoted in Russia Under The Bolshevik Regime, Richard Pipes, New York: NY, Vintage Books, 1995, p. 252, and in Yvon de Begnac, Palazzo Venezia: Storia di un Regime, Rome, 1950, p. 361. This is what we propose now to the Treasury: either the property owners expropriate themselves, or we summon the masses of war veterans to march against these obstacles and overthrow them. As quoted by Mussolini as leader of the Revolutionary Fascist Party (1919) in Fascism and Big Business by Daniel Guerin (1973) p. 83. From article in Mussolini’s Popolo d’Italia on June 19, 1919. When the war is over, in the world's social revolution that will be followed by a more equitable distribution of the earth's riches, due account must be kept of the sacrifices and of the discipline maintained by the Italian workers. The Fascist revolution will make another decisive step to shorten social distances. Mussolini’s speech in Rome, Italy, February 23, 1941. Published in the New York Times, February 24, 1941. Although we can discuss the question of what socialism is, what is its program and what are its tactics, one thing is obvious: the official Italian Socialist Party has been reactionary and absolutely conservative. I shall defend this pact with all my strength, and if Fascism does not follow me in collaboration with the Socialists, at least no one can force me to follow Fascism. [Provincial Fascism is] “no longer liberation, but tyranny; no longer protector of the nation, but defense of private interests and of the dullest, deafest, most miserable cast that exists in Italy." As quoted in Mediterranean Fascism 1919-1945, edit., Charles F. Delzell, The MacMillian Press (1970) p. 23. Speech given on June 21, 1921 in Italy’s Chamber of Deputies. To-day we can affirm that the capitalistic method of production is out of date. So is the doctrine of laissez-faire, the theoretical basis of capitalism… To-day we are taking a new and decisive step in the path of revolution. A revolution, in order to be great, must be a social revolution. From Mussolini's Fasci Italiani di Combattimento (Italian Combat Fasci), Il Popolo d'Italia newspaper, June 6, 1919. Speech published in Revolutionary Fascism, by Erik Norling, Lisbon, Finis Mundi Press (2011) p. 92. The root of our psychological weakness was this: We socialists have never examined the problems of nations. The International was never concerned with it. The International is dead, paralyzed by events. Ten million proletarians are today on the battlefield. Speech (21 June 1921), "Through Fascism to World Power: A History of the Revolution in Italy". Ion Smeaton Munro. 27 January 2008. Address to the National Corporative Council (Nov. 14, 1933), in A Primer of Italian Fascism, edited/translated by Jeffrey T. Schnapp (2000) p 160. Speech quoted in Three Faces of Fascism: Action Française, Italian Fascism, National Socialism by Ernst Nolte, Henry Holt & Company, Inc. (1966) p. 154. Speech given on June 21, 1921 in Italy’s Chamber of Deputies. As quoted in The Fate of Trade Unions Under Fascism, by Gaetano Salvemini, chapter 3: “Italian Trade Unions Under Fascism”, New York: NY, published by Anti-Fascist Literature Committee, 1937, p. 35. As long as 1911, when I was still a member of the Socialist Party, I wrote that the Gordian knot of Trent could be cut only by the sword. At the same date I declared that war is usually the prelude to revolution. It was therefore easy for me, when the Great War broke out, to predict the Russian and the German revolutions. Comrade Tassinari was right in stating that for a revolution to be great, for it to make a deep impression on the life of the people and on history, it must be a social revolution. Speech to the National Corporative Council (Nov. 14, 1933), in A Primer of Italian Fascism, edited/translated by Jeffrey T. Schnapp (2000) p.163. Liberty is a duty, not a right. Speech on the 5th anniversary of the Combat Leagues (24 March 1924) quoted in Ezra Pound and Italian Fascism (1991) by Tim Redman, p. 114. Speech at the Italian Socialist Party’s meeting in Milan at the People’s Theatre on Nov. 25, 1914. Quote in Revolutionary Fascism by Erik Norling, Lisbon, Finis Mundi Press (2011) p. 88. Socialism has to remain a terrifying and a majestic thing. If we follow this line, we shall be able to face our enemies. The law of socialism is that of the desert: a tooth for a tooth, an eye for an eye. Socialism is a rude and bitter truth, which was born in the conflict of opposing forces and in violence. Socialism is war, and woe to those who are cowardly in war. They will be defeated. As quoted in Il Duce: The Life and Work of Benito Mussolini, L. Kemechey, New York: NY, Richard R. Smith (1930) p. 56. Written just before taking editorship of the Italian Socialist Party newspaper Avanti in 1912. [Marx was] the magnificent philosopher of working class violence. As quoted by Mussolini in From George Sorel: Essays in Socialism and Philosophy by John L. Stanley (1987) p. 4. For this I have been and am a socialist. The accusation of inconsistency has no foundation. My conduct has always been straight in the sense of looking at the substance of things and not to the form. I adapted socialisticamente to reality. As the evolution of society belied many of the prophecies of Marx, the true socialism folded from possible to probable. The only feasible socialism socialisticamente is corporatism, confluence, balance and justice interests compared to the collective interest. Religion is a species of mental disease. It has always had a pathological reaction on mankind. As quoted by Mussolini in 2000 Years of Disbelief: Famous People with the Courage to Doubtby James A. Haught (1966) p. 256. From a speech he made in Lausanne, July 1904. Science is now in the process of destroying religious dogma. The dogma of the divine creation is recognized as absurd. As quoted by Mussolini in 2000 Years of Disbelief: Famous People with the Courage to Doubtby James A. Haught (1966) p. 256. Originally came from Mussolini’s essay l'Homme et la Divinité, 1904. ...It was therefore not sufficient to create—as some have said superficially—an anti-altar to the altar of socialism. It was necessary to imagine a wholly new political conception,adequate to the living reality of the twentieth century, overcoming at the same time the ideological worship of liberalism, the limited horizons of various spent and exhausted democracies, and finally the violently Utopian spirit of Bolshevism. My Autobiography, New York, C. Scribner's Sons, 1928. Reprinted in Benito Mussolini, My Rise And Fall, Volumes 1-2 Da Capo Press, 1998 (p.40). My labor had not been easy nor light; our Masonry had spun a most intricate net of anti-religious activity; it dominated the currents of thought; it exercised its influence over publishing houses, over teaching, over the administration of justice and even over certain dominant sections of the armed forces. To give an idea of how far things had gone, this significant example is sufficient. When, in parliament, I delivered my first speech of November 16, 1922, after the Fascist revolution, I concluded by invoking the assistance of God in my difficult task. Well, this sentence of mine seemed to be out of place! In the Italian parliament, a field of action for Italian Masonry, the name of God had been banned for a long time. Not even the Popular party — the so-called Catholic party — had ever thought of speaking of God. In Italy, a political man did not even turn his thoughts to the Divinity. And, even if he had ever thought of doing so, political opportunism and cowardice would have deterred him, particularly in a legislative assembly. It remained for me to make this bold innovation! And in an intense period of revolution! What is the truth! It is that a faith openly professed is a sign of strength. I have seen the religious spirit bloom again; churches once more are crowded, the ministers of God are themselves invested with new respect. Fascism has done and is doing its duty. Fascism was not the protector of any one class, but a supreme regulator of the relations between all citizens of a state. My Autobiography by Mussolini, New York: NY, Charles Scribner’s Sons (1928) p. 280. Yet the Fascist State is unique, and an original creation. It is not reactionary, but revolutionary, in that it anticipates the solution of the universal political problems which elsewhere have to be settled in the political field by the rivalry of parties, the excessive power of the Parliamentary regime and the irresponsibility of political assemblies. Above all, Fascism, in so far as it considers and observes the future and the development of humanity quite apart from political considerations of the moment, believes neither in the possibility nor the utility of perpetual peace. It thus repudiates the doctrine of Pacifism — born of a renunciation of struggle and an act of cowardice in the face of sacrifice. War alone brings up to its highest tension all human energy and puts the stamp of nobility upon the people who have the courage to meet it. All other trials are substitutes, which never really put a man in front of himself in the alternative of life and death. The Fascist accepts life and loves it, knowing nothing of and despising suicide; he rather conceives of life as duty and struggle and conquest, life which should be high and full, lived for oneself, but above all for others — those who are at hand and those who are far distant, contemporaries, and those who will come after. Quoted from “The Labor Charter: The Corporate State and its Organization”, promulgated by Mussolini's Grand Council of Fascism, Article 9, (April 21, 1927) Copy found in Mediterranean Fascism 1919-1945, Charles F. Delzell, The MacMillan Press, (1971) p. 122. Also in Benito Mussolini’s “Doctrine of Fascism”, published as “Fascism: Doctrine and Institutions” (1935), Rome: Ardita Publishers, p.135-136. "The Doctrine of Fascism", June 1932. Quoted in Paul O'Brien, Mussolini in the First World War: The Journalist, the Soldier, the Fascist. Bloomsbury Publishing, 2014. Also in Peter N. Stearns, World History in Documents: A Comparative Reader. NYU Press, 2008. Against individualism, the Fascist conception is for the State; and it is for the individual in so far as he coincides with the State . . . . It is opposed to classical Liberalism . . . . Liberalism denied the State in the interests of the particular individual; Fascism reaffirms the State as the true reality of the individual. Fascism recognizes the real needs which gave rise to socialism and trade unionism, giving them due weight in the guild or corporative system in which divergent interests are coordinated and harmonized in the unity of the State. “The Doctrine of Fascism” (1935 version), Firenze: Vallecchi Editore, p.15. *Race! It is a feeling, not a reality: ninety-five percent, at least, is a feeling. Nothing will ever make me believe that biologically pure races can be shown to exist today. Amusingly enough, not one of those who have proclaimed the "nobility" of the Teutonic race was himself a Teuton. National pride has no need of the delirium of race. Anti-Semitism does not exist in Italy… Whenever things go awry in Germany, the Jews are blamed for it. As quoted in Talks with Mussolini, Emil Ludwig, Boston, MA, Little, Brown and Company (1933) pp. 70-71. Mussolini’s interview was in 1932. As quoted in Talks with Mussolini, Emil Ludwig, Boston, MA, Little, Brown and Company (1933). Mussolini’s interview was in 1932. Variant: I shall make my own life a masterpiece. I have no love for the Jews, but they have great influence everywhere. It is better to leave them alone. Hitler's antisemitism has already brought him more enemies than is necessary. Mussolini in conversation with the Austrian ambassador to Italy in 1932 over the then-predicted rise of Adolf Hitler to power in Germany. As quoted in Esau's Tears: Modern Anti-Semitism and the Rise of the Jews, Albert S. Lindemann, Cambridge University Press (1997), p466. As Quoted in The New Inquisitions: Heretic-Hunting and the Intellectual Origins of Modern Totalitarianism, Arthur Versluis, Oxford University Press (2006) p. 39. The Truth Apparent, apparent to everyone's eyes who are not blinded by dogmatism, is that men are perhaps weary of liberty. They have a surfeit of it. Liberty is no longer the virgin, chaste and severe, to be fought for … we have buried the putrid corpse of liberty … the Italian people are a race of sheep. Marx was the greatest of all theorists of socialism. As quoted in Mussolini: A Biography by Denis Mack Smith (1983) p. 7. Original source: Opera Omnia di Benito Mussolini (OO) 1/102-3 (14 Mar. 1908), 135, 142. “ No one knows better than I with forty years' political experience that policy--particularly a revolutionary policy--has its tactical requirements. I recognised the Soviets in 1924. In 1934, I signed with them a treaty of commerce and friendship. I, therefore, understood that, especially as Ribbentrop's forecast about the non-intervention of Britain and France has not come off, you are obliged to avoid the second front [with Russia]. You have had to pay for this in that Russia has, without striking a blow, been the great profiteer of the war in Poland and the Baltic. War is to man what motherhood is to a woman. From a philosophical and doctrinal viewpoint, I do not believe in perpetual peace. He has been frequently heard to say, that in this world he would rather live two days like a tiger, than two hundred years like a sheep. You cannot get rid of me because I am and always will be a socialist. You hate me because you still love me. Denis Mack Smith, Mussolini: A Biography (1983) p. 8. As quoted by Mussolini after he was expelled from the Italian Socialist Party in 1914. The Lazio Speeches (1936), as quoted in The Book of Italian Wisdom by Antonio Santi, Citadel Press, (2003) p. 87. The Lazio Speeches (1936), as quoted in The Book of Italian Wisdom by Antonio Santi, Citadel Press, 2003. p. 88. I am making superhuman efforts to educate this people. When they have learnt to obey, they will believe what I tell them. I bequeath the republic to the republicans and not to the monarchists, and the work of social reform to the socialist and not to the middle class. Joshua Muravchik, as quoted in Heaven on Earth: The Rise and Fall of Socialism, Encounter Books (2002) p. 170. Inside every anarchist is a failed dictator. This quote spread rapidly in the United States after appearing in a column by Molly Ivins (24 November 2002). It is repeated often and sometimes attributed to the "Fascism" entry in the 1932 Enciclopedia Italiana. However hard copies of the 1932 Enciclopedia Italiana exist in numerous libraries and the alleged quote is not in the text, nor is there anything that would support the alleged quote. A vaguely similar statement does appear in Doctrine of Fascism. We are, in other words, a state which controls all forces acting in nature. We control political forces, we control moral forces, we control economic forces, therefore we are a full-blown Corporative state. The same document explains that the "corporations" (corporazioni) on which the Fascist state rested were its own creations, modeled on guild associations and not private companies, which Italian normally calls società. For details see "Mussolini on the Corporate State" by Chip Berlet. From Jane Soames’s authorized translation of Mussolini’s “The Political and Social Doctrine of Fascism,” Hogarth Press, London, (1933), p. 20. Julius Evola reproduced the original Italian as "un secolo della 'Destra'" ("a century of the right"); see Evola, Fascismo e Terzo Reich. Several English translations agree with Evola's wording, including one published by the Fascist government in 1935 and transcribed online. Beginning life as a ranting Socialist of the worst type, he abjured Socialism the moment he saw better opportunities for himself on the other side, and ever since then he has devoted himself gaudily to clapping Socialists in jail, filling them with castor oil, sending blacklegs to burn down their houses, and otherwise roughing them. Mussolini is the biggest bluff in Europe. If Mussolini would have me taken out and shot tomorrow morning I would still regard him as a bluff. The difference between the Italian railway service in 1919, 1920 and 1921 and that which obtained during the first year of the Mussolini regime was almost beyond belief. He never killed anyone, he sent people on holiday to confine them. Stalin will never make socialism; rather Mussolini will. Nicola Bombacci as quoted in Mussolini, R.J.B. Bosworth, New York: NY, Bloomsbury Academic (2011) p. 511, originally from the Fascist newspaper La Verità (March 1945). Long live Mussolini! Long live socialism! Nicola Bombacci before being shot with Mussolini in 1945. Quoted in Heaven on Earth: The Rise and Fall of Socialism by Joshua Muravchik, (2002) p. 171. As the elections were being held, he published in Gerarchla a disquisition on Machiavelli. He had, he remarked, just re-read the Florentine writer's corpus, although, he added modestly, he had not fully plumbed the secondary literature in Italy and abroad. Machiavelli's thought was, Mussolini announced, more alive now than ever. His pessimism about human nature was eternal in its acuity. Individuals simply could not be relied on voluntarily to 'obey the law, pay their taxes and serve in war'. No well-ordered society could want the people to be sovereign. Machiavelli’s cynical acumen exposed the fatuity of the dreams of the Enlightenment (and of Mussolini’s own political philosophy before 1914). Which European politician of the first half of the twentieth century could be relied on to read the philosophical and literary works of his co-nationals and send their authors notes of criticism and congratulation? Who, at the time of profound crisis and despite his evident ill health, kept on his desk a copy of the works of Socrates and Plato, annotated in his own hand? Who declared publicly that he loved trees and anxiously quizzed his bureaucracy about storm damage to the environment? Who, in his table talk while he was entrenched in power, was fascinated by the task of tracing his intellectual antecedents?... Who seemed almost always ready to grant an interview and, having done so, was especially pleased by the prospect of talking about contemporary political and philosophical ideas? Who left more than 44 volumes of his collected works? Who claimed with an element of truth that money never dirtied his hands? Who could conduct a conversation in three languages apart from his own?... The somewhat surprising answer to all these questions is Benito Mussolini, Duce of Italian Fascism and dictator of Italy from 1922 (or 1925) to 1945 (or 1943). [One of the] leading statesmen in the world. Richard Washburn Child, former ambassador to the U.S and ghost-writer of Mussolini's autobiography, as quoted in Introduction: A Political-Biographical Sketch by Tariq Ali in Class War Conservatism and Other Essays (2015) by Ralph Miliband. What a man! I have lost my heart!... Fascism has rendered a service to the entire world... If I were Italian, I am sure I would have been with you entirely from the beginning of your victorious struggle against the bestial appetites and passion of Leninism. Winston Churchill, in a letter to Mussolini, after a visit to Rome (1927) "Top Ten Facts About Mussolini". RonterPening.com. 27 January 2008. Mussolini is a brilliant thinker whose philosophy, though unorthodox, flows out of the true European tradition. If he is a myth-maker, he is, like Plato's guardians, conscious that "the noble lie" is a lie. The greatest genius of the modern age. Recently the New York Sun reported that when auditors got into the books of Mussolini's treasury, after his fall, they discovered that a large part of his deficit was due to the paying out of huge sums in subsidies to conceal the rise in the cost of living - a plan industriously urged here by the Hansen group and adopted by the President but as yet resisted by Congress. To Benito Mussolini, from an old man who greets in the ruler, the Hero of Culture. Unfortunately, I am no superman like Mussolini. Mahatma Gandhi, "Pound in Purgatory". Leon Surette. 27 January 2008. Surette refers to this as "Gandhi's undoubtedly facetious remark". On November 24, 1914, when he was expelled from the Socialist Party, Mussolini insisted that his expulsion could not divest him of his ‘socialist faith.’ He made the subtitle of his new paper, Popolo d’Italia, ‘A Socialist Daily.’ National intervention in the European conflagration was an immediate issue and as a problem it divided socialists, but since most continental socialist parties had opted for war, Mussolini conceived at that time that interventionism was not a commitment sufficient to require the abandonment of socialism. I feel like turning to my American friends and asking them whether they don't think we too need a man like Mussolini. Still, the democratic governments are jabbering about these things, while Germany and Italy continue to pour in thousands of trained soldiers. It should be obvious to the blind that not only Hitler and Mussolini but Mr. Blum and Mr. Baldwin are in league in their intentions to crush the anti-fascist struggle and to drown in the blood of the Spanish people the maginificent beginnings of a new social structure. Emma Goldman, Letter to Mark Mratchny, 1937, quoted in Vision on Fire: Emma Goldman on the Spanish Revolution, edited by David Porter, 2006, (p. 186). Once in power, Mussolini, established the model totalitarian state. Having smashed the organisations of the workers, the way was prepared for a savage attack on the standards of the masses in the interests of Big Business. The main brunt of fascism was borne by the working class, against whom it is aimed above all. With their weapons of struggle broken, with the establishment of scab company unions, the conditions were created to drive down the wages and lower the standards of living of the workers. The Labour unions were crushed. Shop stewards' representation in the factories was abolished. The right to strike ended. All Union contracts were rendered void. The employer reigned supreme in the factories once again. He became at the same tune, the "leader" of his employees. Any attempt to strike, any resistance to the wishes of the employer, was "punished with ferocious, penalties by the State. To challenge the employer was to challenge the full force of the State. In the words of the fascists: strikes are crimes "against the social community". Mussolini is a great executive, a true leader of men, and the great works he has accomplished are his genuine fortifications to a high place in history and in the hearts of his people. Millicent Hearst, the wife of William Randolph Hearst, after a visit to Rome where she met Mussolini in the early 1930s. Mussolini insisted that Fascism was the only form of ‘socialism’ appropriate to the ‘proletarian nations’ of the twentieth century. A. James Gregor, Phoenix: Fascism in Our Time, New Brunswick: NJ, Transaction Press, 2009, p. 191. Mussolini is the biggest bluff in Europe. If Mussolini would have me taken out and shot tomorrow morning I would still regard him as a bluff. The shooting would be a bluff. The Fascist dictator had announced that he would receive the press. Everybody came. We all crowded into the room. Mussolini sat at his desk reading a book.… Mentally he was already reading the lines of the two thousand newspapers served by the two hundred correspondents. "As we entered the room the Black Shirt Dictator did not look up from the book he was reading, so intense was his concentration, etc." I tip-toed over behind him to see what the book was that he was reading with such avid interest. It was a French-English dictionary—held upside down. The Brown shirt would probably not have existed without the Black shirt. The march on Rome in 1922 was one of the turning points of history. The mere fact that anything of the sort could be attempted and could succeed, gave us impetus... If Mussolini had been outdistanced by Marxism, I don’t know whether we could have succeeded in holding out. At that time National Socialism was a very fragile growth. As I walked with him in the gardens of the Villa Borghese, I could easily compare his profile with that of the Roman busts, and I realized he was one of the Caesars. There's no doubt at all that Mussolini is the heir of the great men of that period. Adolf Hitler, 21-22 July, 1941. Quoted in Hitler's Table Talk 1941-1944: Secret Conversations Edited by Hugh Trevor-Roper and Gerhard L. Weinberg. Enigma Books, 2013.(pp.9-10). I have myself seen in a dozen different episodes in Italy how very popular the Duce is with the majority of the people; and there is no denying the unparalleled achievements of this man and of Fascism—the innumerable new factories, the construction of new houses and schools and hospitals, the great colonial enterprise and many more; when one recalls the deplorable state of Italy at the time of the Duce’s assumption of power, one realises the magnitude of his achievements.Over and above all this he overcame Bolshevism, not by military force, but by superior intellect, and it is him we have to thank for showing for the first time, by his decisive defeat of the inner power of Bolshevism, that even in this twentieth century it is possible to recall a people to a sense of purely national pride. Adolf Hitler, 24th July 1942. Quoted in Hitler's Table Talk 1941-1944: Secret Conversations Edited by Hugh Trevor-Roper and Gerhard L. Weinberg. Enigma Books, 2013 (p.447). For Mussolini, syndicalism was the most modern embodiment of the spirit of Marxist doctrine, which he added to the myths of his Nietzschean aristocratic philosophy to reach a socialism of quality rather than quantity. Mussolini was a Marxist ‘heretic'. A. James Gregor, Young Mussolini and the Intellectual Origins of Fascism, Berkeley: University of California Press, 1979, p. xi. Mussolini was a reluctant fascist because, underneath, he remained a Marxist, albeit a heretical one. Paul Johnson (writer), Modern Times: A History of the World from the 1920s to the 1980s (2001) p. 101. Mussolini began as a disciple of Lenin and did not so much repudiate Marxism-Leninism as become a self-declared “heretic.” Thus one of Mussolini’s groups of thugs called itself the Cheka, after Lenin’s secret police. Mussolini has substituted efficient and energetic and progressive processes of government for Parliamentary wrangling and wasteful impotent bureaucracy. He has engendered among the people a spirit of order, discipline, hard work, patriotic devotion and faith.… Italy has attained extraordinary progress, in every respect thanks to the clear sighted and masterful guidance of that remarkable man, Benito Mussolini.". A very upstanding chap [who has] done a good job in Italy … [I] continue to be impressed with the innate strength of the present government and sound ideas which govern it. [Mussolini] has always retained a great admiration for Bolshevism, though he presented himself to the public as an antidote to Bolshevism. Francesco Saverio Nitti, Bolshevism, Fascism and Democracy, former Prime Minister of Italy (1919-1920), (1927) p. 73. Even if [in defining 'fascism'] we limit ourselves to our own century and its two most notorious cases, Nazi Germany and Fascist Italy, we find that they display profound differences. How can we lump together Mussolini and Hitler, the one surrounded by Jewish henchmen and a Jewish mistress, the other an obsessed antisemite? The sweeping social changes proposed by Mussolini's first Fascist program of April 1919 (including the vote for women, the eight-hour day, heavy taxation of war profits, confiscation of church lands, and workers' participation in industrial management) stand in flagrant conflict with the macho persona of the later Duce and his deals with conservatives. Mussolini would be totally forgotten today if some of his lieutenants in the provinces had not discovered different vocations -- bashing Slovenes in Trieste in July 1920 and bashing socialist organizers of farm workers in the Po Valley in fall and winter 1920-21. Mussolini supported these new initiatives by the ras, and his movement turned into something else, thereafter prospering mightily. Neither Hitler nor Mussolini took the helm by force, even if they used force earlier to destablize the liberal regime and later to transform their governments into dictatorships. Mussolini spoke of himself as an 'authoritarian' and 'aristocratic' Socialist; he was elitist and antiparliamentarian, and he believed in regenerative violence. Like the revolutionary syndicalists (and, in a different manner, Lenin), Mussolini believed that only a special revolutionary vanguard could create a new revolutionary society. Mussolini was the greatest man of our century, but he committed certain disastrous errors. I, who have the advantage of his precedent before me, shall follow in his footsteps but also avoid his errors. Juan Perón. Quoted in "Argentina, 1943-1979: The National Revolution and Resistance" by Donald C. Hodges. Even as the Fascist leader, Mussolini never concealed his sympathy and admiration for Communism: he thought highly of Lenin’s ‘brutal energy,’ and saw nothing objectionable in Bolshevik massacres of hostages. He proudly claimed Italian Communism as his child. Richard Pipes, Russia Under The Bolshevik Regime, New York: NY, Vintage Books (1995) p. 252. Cole Porter, in the original lyrics of "You're The Top" from Anything Goes (1934); these lines were later omitted. [I]t is perhaps to Mussolini's credit as a human being that his nationalism was clearly heartfelt where Stalin's was undoubtedly a mere convenience. Ronald Reagan. Time in 1976. Reagan adviser Jude Wanniski has indicated that, in 1933, New Dealers as well as much of the world admired Mussolini’s success in avoiding the Great Depression. Your figure is not just an Italian one. You are the apostle of the world campaign against dissolution and anarchy...Fascism...is a universal phenomenon that ought to conquer all nations...Fascism is a living Gospel. The difference between the Italian railway service in 1919, 1920 and 1921 and that which obtained during the first year of the Mussolini regime was almost beyond belief. The cars were clean, the employees were snappy and courteous, and trains arrived at and left the stations on time — not fifteen minutes late, and not five minutes late; but on the minute. Mussolini accelerated the process after the conquest of Ethiopia (1935-6). The war in Africa was to provide a new context for Fascism’s scheme of social engineering. Franklin D. Roosevelt to US Ambassador to Italy Breckinridge Long, Schivelbusch, Wolfgang. ''Three New Deals : Reflections on Roosevelt's America, Mussolini's Italy, and Hitler's Germany, 1933-1939. Macmillan. In Italy, comrades, in Italy there was but a Socialist able enough to lead the people through a revolutionary path, Benito Mussolini. Vladimir Lenin, as quoted in Revolutionary Fascism, Erik Norling, Lisbon, Finis Mundi Press (2011) p. 28. Lenin express this to Nicola Bombacci during a reception in the Kremlin. Mussolini told the young man of his admiration for Communism—‘Fascism is the same thing’ [as Communism]. As quoted in The Politics of Upheaval: 1935-1936 (The Age of Roosevelt, Vol. III), Arthur M. Schlesinger, Jr., New York: NY, Mariner Book: Houghton Mifflin Co., (2003) p. 147. Mussolini’s 1931 statement to Alfred Bingham, the son of a U.S. Republican Senator. Some of the things Mussolini has done, and some that he is threatening to do go further in the direction of Socialism than the English Labour Party could yet venture if they were in power. Letter from George Bernard Shaw to a friend 7th Feb, 1927. [Mussolini was] farther to the Left in his political opinions than any of his socialist rivals. George Bernard Shaw as quoted in Socialism and Superior Brains, Gareth Griffith, Taylor and Francis e-Library (2003) p. 253. Shaw made this statement in the Manchester Guardian in 1927. Arthur M. Schlesinger, Jr., The Politics of Upheaval: 1935-1936 (The Age of Roosevelt, Vol. III), New York: NY, Mariner Book: Houghton Mifflin Co. (2003) p. 648. For Chesterton… British public rhetoric was more than a mere style: "The motive is the desire to disguise a thing even when expressing it." To his mind, the dictator's words, even if his actions were as bad or worse than those of the parliamentarians, were morally and stylistically superior. At least they said openly what was being done openly. The British rhetoric, for Chesteron, was one with the decayed British liberalism that allowed exploitation of workers by plutocrats who were never rebuked by government or the courts. If nothing else, Mussolini's language was a bracing alternative. So fell, ignominiously, the modern Roman Caesar, a bellicose-sounding man of the twentieth century who had known how to profit from its confusions and despair, but who underneath the gaudy facade was made largely of sawdust. As a person he was not unintelligent. He had read widely in history and thought he understood its lessons. But as a dictator he had made the fatal mistake of seeking to make a martial, imperial Great Power of a country which lacked the industrial resources to become one and whose people, unlike the Germans, were too civilized, too sophisticated, too down to earth to be attracted by such false ambitions. The Italian people, at heart, had never, like the Germans, embraced fascism. They had merely suffered it, knowing that it was a passing phase, and Mussolini toward the end seems to have realized this. But like all dictators he was carried away by power, which, as it inevitably must, corrupted him, corroding his mind and poisoning his judgment. This led him to his second fatal mistake of tying his fortunes and those of Italy to the Third Reich. When the bell began to toll for Hitler's Germany it began to toll for Mussolini's Italy, and as the summer of 1943 came the Italian leader heard it. But there was nothing he could do to escape his fate. By then he was a prisoner of Hitler. Not a gun was fired- not even by the Fascist militia- to save him. Not a voice was raised in his defense. No one seemed to mind the humiliating nature of his departure- being hauled away from the King's presence to jail in an ambulance. On the contrary, there was general rejoicing at his fall. Fascism collapsed as easily as its founder. [Mussolini] brought a radical Marxist strand to the Avanti! newspaper, soon doubling its circulation. With a growing audience, Mussolini redoubled the urgency of his utopian propaganda; ‘private property is theft’ and should be abolished as Italy moved through the phase of collectivism forwards to the ultimate goal of communism. Lenin was the contemporary politician whom [Mussolini] most admired and he studied the Russian revolution closely to see what lessons it offered. Lenin seemed to him ‘the very negation of socialism’ because he had not created a dictatorship of the proletariat or of the socialist party, but only of a few intellectuals who had found the secret of winning power. Mussolini was, in truth, envious. Mussolini had once belonged to the Bolshevik wing of the Italian Socialist party and still in 1924 confessed admiration for Lenin, while Trotsky was quoted as saying that Mussolini was his best pupil. Denis Mack Smith, Mussolini: A Biography, New York: NY, Vintage Books, (1983) p. 96. [In 1938] Mussolini anti-clericalism was thus reassuring itself. Sometimes he now acknowledged that he was an outright disbeliever... [that] the papacy was a malignant tumor in the body of Italy and must 'be rooted out once and for all,’ because there was no room in Rome for both the Pope and himself. Mussolini had been envious of the bolsheviks and for a while fancied himself as the Lenin of Italy. Denis Mack Smith, Modern Italy: A Political History, University of Michigan Press (1997) p. 284. When the workers first occupied the factories, Mussolini bethought himself of ‘Red Week.’ This time [summer of 1920] he concluded, social revolution was really at hand. Eager as always to ride the wave of the future and still posing as a left-wing extremist, he applauded the strikes. But as soon as it became apparent that he had guessed wrong once again, he executed an abrupt about-face. After his defeat in the 1919 election, Mussolini saw no future in trying to out-socialist the socialists. Without a distinct policy, without friends and backing, he was in serious danger of ending up as a confused and egocentric demagogue with a talent for histrionics. [Mussolin is] a man no less extraordinary than Lenin. He, too, is a political genius, of a greater reach than all the statesmen of the day, with the only exception of Lenin. . . not a socialist from the bourgeoisie; he never believed in parliamentary socialism. Zeev Sternhell with Mario Sznajder, Maia Asheri, The Birth of Fascist Ideology: From Cultural Rebellion to Political Revolution, Princeton: NJ, Princeton University Press, 1994, p. 197. From 1912 to 1914, Mussolini was the Che Guevara of his day, a living saint of leftism. Handsome, courageous, charismatic, an erudite Marxist, a riveting speaker and writer, a dedicated class warrior to the core, he was the peerless duce of the Italian Left. Adlai Stevenson, Speech to the Los Angeles Town Club, Los Angeles, California (11 September 1952); Speeches of Adlai Stevenson (1952), p. 36. By then the Duce... was a sick man, living on a diet of milk and rice, whose political strength at home was growing more feeble by the day. In late 1942, he had tried to talk Hitler into making peace with the Russians. It was their only chance to avoid disaster, he argued. The Fuehrer, of course, would have none of it. About all Mussolini was good for now, it seemed, was strutting about in one of his snappy getups. But then, at least he still looked like he amounted to something. [Mussolini] was the only man who could have brought about the revolution of the proletariat in Italy. Leon Trotsky as quoted in Il Duce: The Life and Work of Benito Mussolini, by L. Kemechey, New York: NY, Richard R. Smith (1930) p. 47. Leon Trotsky, "How Mussolini Triumphed" in What Next? Vital Question for the German Proletariat, 1932 . Mussolini's speech on the Declaration of War on France and England (10 June 1940). globalrhetoric.wordpress.com. Speech, Rome, Italy (23 February 1941). www.ibiblio.org. Mussolini's capture and execution. October 25, 2008. www.custermen.com.